A lot of people think that Thin-o-matics only used micro-rotor movements. However, that's not really the case. It's probably mostly the case but not all the way. There are plenty of Thin-o-matics that use an ETA movement. 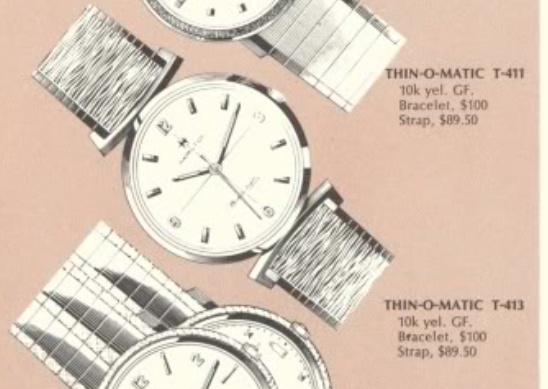 One of them is the 1965 Thin-o-matic T-413. It was made through 1969. As part of the 400-series, the T-412 came in a 10K gold filled case. You could get it with a specially matched bracelet or on a strap. One of the unique attributes of the model is the shape of the lugs. They attach to the case at two points, the 12 and the 6. I recently picked up a T-416 mainly because it had its original bracelet. It was listed as not running and not setting and that is, in a nutshell, not good. The lower lower left lug looks a little odd. It's obviously been bent. Hopefully I can bend it back in shape. The right side of the case looks like it should. Notice the angle of the lug ends. And here's the left side. Notice the angle of the lug on the right. Maybe by bending it back up I can straighten it all out. The watch opens through the crystal. With that out of the way I can swing the movement out. The female side of the two-piece stem is rusted in place but the rest of the watch looks great. There must be some reason why it's not running though - maybe it's just dirty inside. This stem will need to be replaced. That's a BIG problem, as this stem is no longer available at many places. It will take some looking to find a replacement. The movement is back to running condition. Half of the female side of the stem broke off so if I didn't need a new stem before, I sure do now. It's running a wee-bit fast but that's easy to correct. The amplitude is a little low because I haven't wound it fully yet. After all, it doesn't have a stem. There, a slight tweak of the regulator index and the beat rate is right where it needs to be. A new 29.4mm crystal will be a nice addition to the finished watch. Well, this watch turned out fairly well. I was able to straighten the lug... mostly. It's not perfect but it's not terrible. This watch is as old as me and I think we're in about the same shape. The original bracelet is definitely a great feature to this watch. The finish on the dial is a little compromised by the moisture that rusted the stem but you'd have to look very closely to notice it.